Since an early age I have been exploring various media and their communicative relationships. Each of my works can be seen as a glimpse through a window into my “processing room”. In this place the mapping of emotions through simple, yet strong use of line, gestural movement, light and textures allows the heart to be revealed. It is a form of visual journaling that goes beyond expressionism for me. Using mostly abstract sculptural language I explore themes that run the gamut from growth, transformation, pain before birth, through to whimsical celebration. This is often a risky adventure to healing. There is something very profound about taking a heavy, layered (and sometimes even flawed) boulder of alabaster and making it fly with life. Digging into the inner life of anything is fraught with danger. Firm blows are required to shape and bring lasting beauty but striking too hard brings pain and heartbreak. 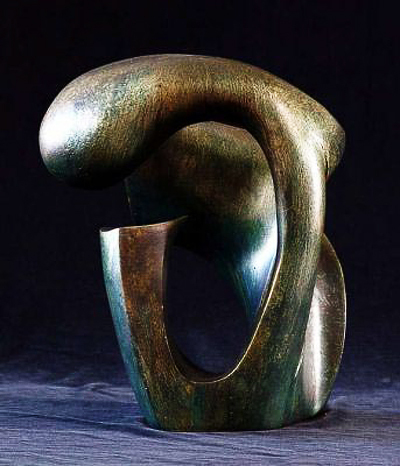 My work, including the two dimensional has always had a sculptural feel. Over the last 20 years I have expressed myself through sculpting, stained glass, fabric art, silk painting, drawing and oils. Stone and glass with their common origin have become my key focus without restricting me to the three dimensional world. At the same time flat glass and other two dimensional media cannot give flight to all of my visions. I find myself compelled to pursue interactive and spontaneous play within my own work but also within the sphere of other local creators. As an active believer in and developer of artistic community I enjoy interaction with those who have different skills. One time when a particular stone would not open up for me to any design, a friend who is a dancer proposed an alternative approach.